The Lord-Lieutenant delivering his speech at the tree planting ceremony. (c) Margate Museums Trust. 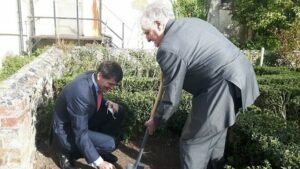 Five trees have been planted in the grounds of Margate’s historic Tudor House as part of the Queen’s Commonwealth Canopy project. The project was launched in 2015 with an appeal to all 53 Commonwealth nations to take part in tree planting to mark Her Majesty’s long service. Tudor House was one of 10,000 organisations and individuals to be planting some 50,000 trees in the UK this Autumn to mark the project. The trees have been donated via a partnership between Sainsbury’s, the Woodland Trust and ITV, which screened The Queen’s Green Planet programme in April. It is thought that the Tudor House was the only venue in Thanet to successfully receive the tree pack, made up of two silver birch, two rowan and one hazel sapling. 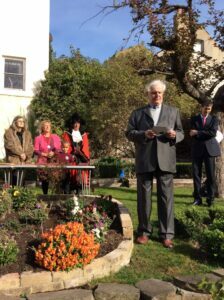 The trees were planted at the ceremony by the Lord Lieutenant, Lady Suzy Gale, Margate Mayor, Cllr Julie Dellar; Margate’s Cllr Iris Johnston and Seppy Oduwole, a pupil from Holy Trinity & St John’s School. The aim of the canopy scheme is to create a unique network of forest conservation projects across the Commonwealth. The Lord-Lieutenant plants the first tree assisted by Robin Haddon, Chairman of Margate Museums Trust. (c) Margate Museums Trust. “The Commonwealth of Nations is a voluntary association of 53 sovereign states. Nearly all of them are former British colonies or dependencies of those colonies. Put simply it is the world’s oldest political association of sovereign states. No one government in the Commonwealth exercises power over the others, as is the case in a political union. Rather, the Commonwealth is an international organisation in which countries with diverse social, political, and economic backgrounds are regarded as equal in status, regardless of size or wealth and collaborate within a framework of common values and goals. Formed in 1947 The Queen has tirelessly led all these Nations as either Head of State or Head of the Commonwealth since 1952, giving advice to all the Heads of Government, often heading off problems out of public view. It is therefore very fitting that we should celebrate her long association with the Commonwealth by creating a Commonwealth Canopy by planting trees across the world to acknowledge her remarkable achievement. Today five of us will plant trees our ages spanning the years of her 66 year reign to date in the hope we will be marking the Platinum Jubilee in 2022. I wonder how many of us here today will remember here accession in 1952.